If you have recently rented an apartment or a home, you know there's plenty of paperwork involved. For one thing, the landlord or rental agent typically wants to verify that you are employed and that you have a bank account. And that could mean trips to the bank and your employer's human resources department. 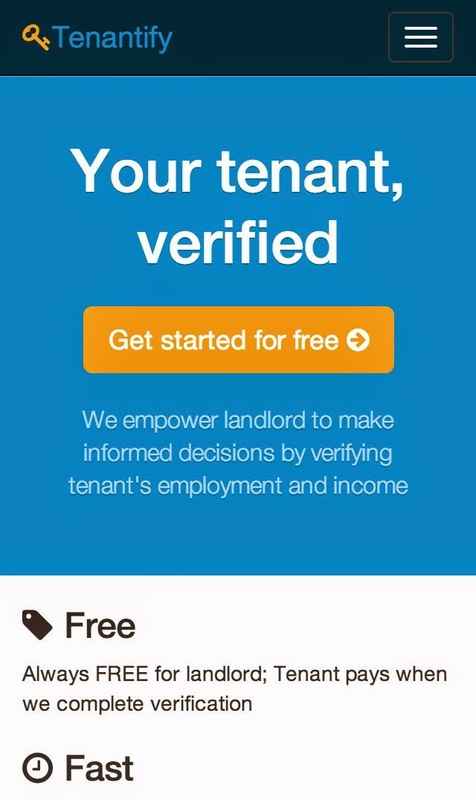 Tenantify is an online service that makes that process as easy as possible for both the tenant and the landlord. The service uses a tenant's electronic statement to verify the banking connection and makes direct contact with a business to verify a tenant's employment status. The service was developed by Songhua Hu, who thought the traditional way of screening prospective tenants could benefit from a dose of 21st Century technology. His system takes some of the friction out of the application process and helps reduce the risk of fraud. "Our goal is to reduce friction in the housing market and build trust between landlord and tenant," he said. The service is free for landlords. Tenants can purchase employment verification for $10, Income verification for $10 or both for $15.